Women talking at a pie supper. Library of Congress photo. Since the settlement of Mesa County, its citizens have formed community groups to bond socially, for charitable causes, or for the ritual of belonging. Some founded local chapters of established organizations. In 1883 and 1884, recent arrivals formed Masonic Lodge Charter Number 55, Grand Army of the Republic Post 35, a local chapter of the Ladies’ Christian Temperance Union (a major proponent of prohibition, and of keeping men folk on the straight and narrow), and the Independent Order of Odd Fellows Mesa Lodge Number 58. The Grand Junction Lions Club organized in 1921 and other Lions Clubs followed, with each club performing important volunteer work and donating to charitable causes. There were also outliers, flash in the pan organizations that sometimes had silly names and were probably never meant to last that long. They met together for comfort and support during hard times, or just for fun. In 1883, the Grand Junction News mentions a few such community groups. The G.L. Club gave “entertainments” and “socials”. The Grand Valley Guards probably imagined themselves training for some glorious battle with the Utes that never materialized, but really, they were good mostly for a military band performance, until they became Company F of the Colorado National Guard. The German Club met to read and discuss Goethe’s works. The Acme Club makes me think of Bugs Bunny cartoons, but they also gave socials. 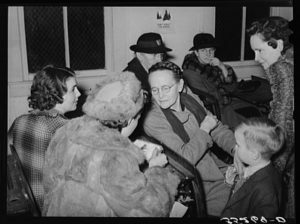 Twentieth century organizations included neighborhood groups formed mostly by women to pass the time, for entertainment and for moral support. Our Day Together was a women’s social group in Orchard Mesa in the early 1900’s. Residents of the Highpoint area north of Fruita formed the Highpoint Rural Life Club. The self-deprecating Ancient Order of Fools was formed by women of Fruitvale during the Great Depression. Their initiation included a Chinese prayer. Members like Sarah Nisley, wife of Fruitvale Schools teacher and superintendent Frank Nisley, threw Halloween parties. Any member who said anything gloomy or mentioned hard times was fined. Other local organizations included The Last Squad Club, the Grand Junction Women’s Club, the Past Presidents Club, the Reviewers Club and the Redlands Womens Club. To learn more about local organizations and local history, search for these organizations in our Mesa County Oral History Project collection.